I am sticking with the FAANG stocks because I believe they will remain leaders, until they’re not. Social media is an addiction and as long as people plaster their faces to phones and computer screens, the money will continue to pour in. I’ve detailed in the past why I like these tech titans so no need to repeat it here again this year. Bottom line, just about everyone uses the products and services of these companies (every day) so I am sticking with what we all know. FB: 176.46. Facebook returned 53% last year and has been a solid performer for several years now. The attraction of this stock is still the data collection and advertising revenues that come from this information. Other than Google, Facebook is the second largest digital advertising revenue generating company in the world. 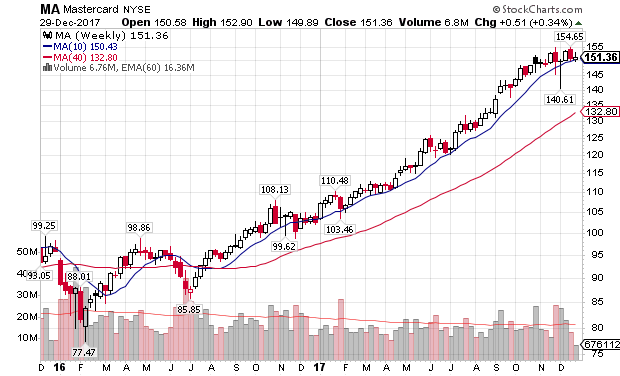 The stock was correcting at the end of 2016 but caught support at the moving averages and catapulted from $115 to as high as $184 in November. 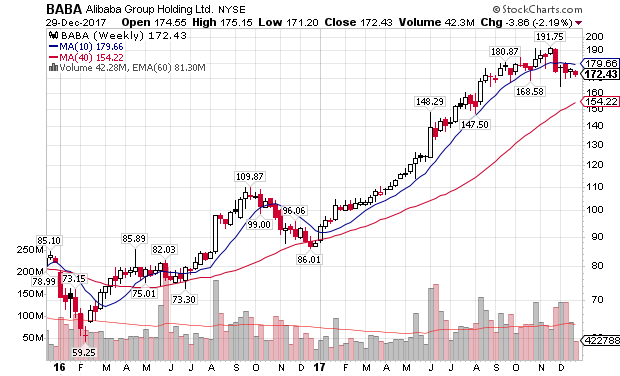 The stock is currently trading sideways and is struggling to make a new high. It crossed below its 50d ma and may revisit the 200d ma (currently near $163). This would be an ideal entry area, should it drop this low and hold support. It may need a breather but I still like the stock long term. BABA: 172.43. Alibaba was the top performing stock in the portfolio last year, returning 96%, while peaking at 118% in November. One can make the argument that BABA is the Chinese version of Amazon and Google wrapped into one. 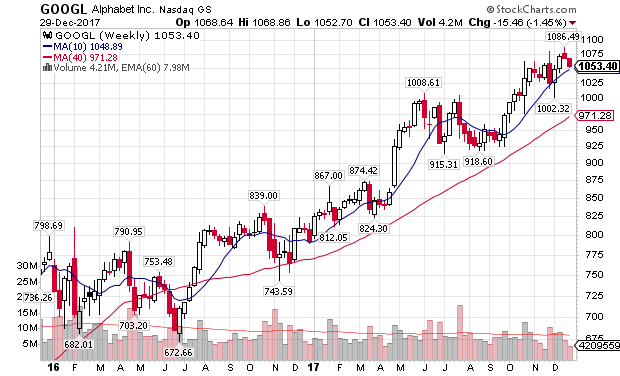 The stock is currently pulling back, below the 50d ma with some support near $170. The 200d ma is down near $154 so there is a chance it could drop further. The consolidation is welcomed after the big run-up in 2017. An ideal area to grab shares is above the moving averages. There’s risk to enter at the current price but I’m holding BABA for long term potential. Please keep in mind that the company operates out of China so the communist government of China is always a wildcard for unanticipated news. AMZN: $1,169.47. Amazon has been a leader in these yearly portfolios for years. Going back to 2015, the stock was trading in the upper $200 range, so it’s a 4x gain in 3 years. 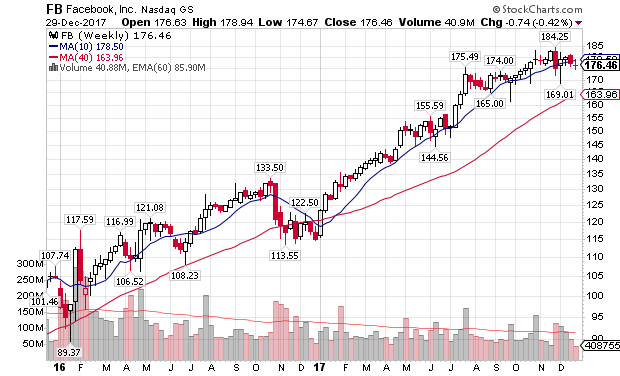 Last January, I mentioned that the stock was “consolidating near it’s 200d ma and if it holds, could be poised for the next leg higher ($750 to $1,000?).”. Well, it blew past $1,000 and gave shareholders a 56% gain. As of now, it’s not far from an all-time high and trading above both major moving averages. I prefer to grab shares at or near a major moving average (ideal area is $1,000). For now, Amazon is still a dominant player so we’re keeping it on the list, even at +$1,100. GOOGL: 1,053.40. Considering Alphabet does so much, digital advertising, wallet, pay, self-driving cars, etc., it’s a must on this list. 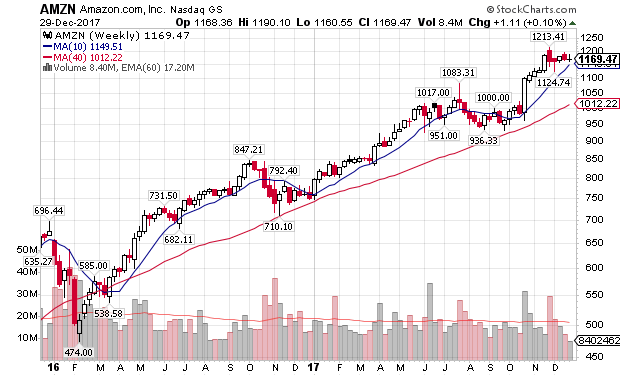 Like Amazon, it’s trading above $1,000 per share and it is not far from a new all-time high, above both major moving averages. 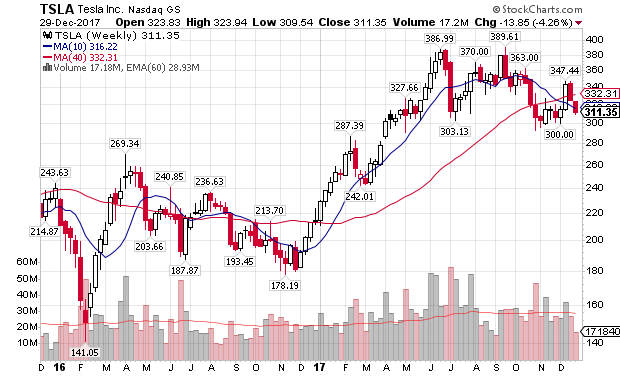 Alphabet has always provided buying opportunities at or near its 200d ma, which is currently down near $970. I would advise grabbing shares closer to that level but I like the stock long term (we must live with the volatility). 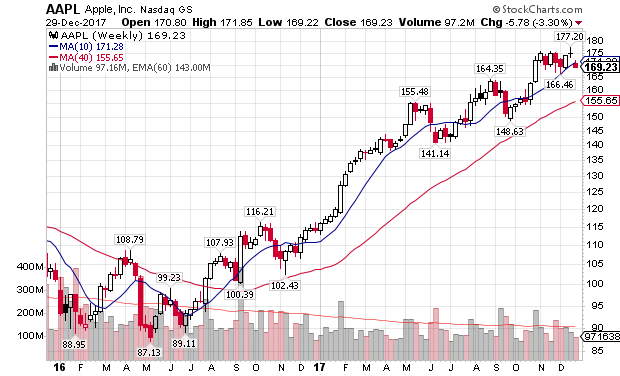 AAPL: 169.23. Apple got back on its horse in 2017 and gave investors a 48% gain. 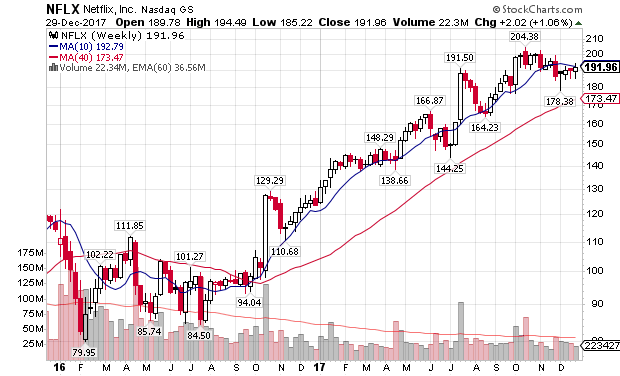 The stock ran into some trouble to close 2017, dropping below its 50d ma but still remains well above the 200d ma (near $155). They always say “cash is king” so if that’s the case, Apple takes the cake with more than $200 billion of it. On the other hand, what does one do with so much cash? I’d tell them to buy Square, among other things. It’s Apple, so I like the stock long term until they screw something up [I’m still an Android guy]. NFLX: 191.96. Netflix had another big year, returning investors 55% in 2017. The stock traded fairly close to its 50d ma most of the year but is currently under that line. 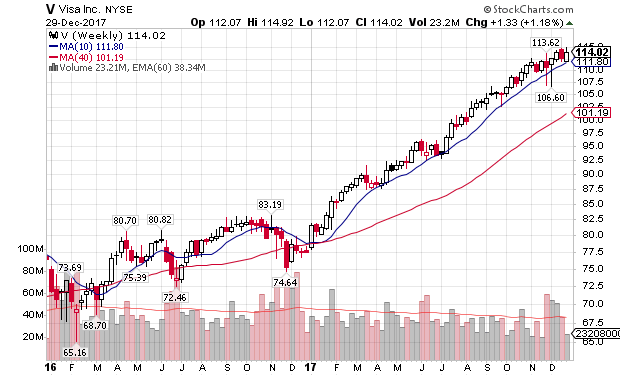 The 200d ma is down near $173 and would be a better risk/return area to grab shares. In any event, keep an eye on the 50d ma, to make sure it doesn’t continue its direction downward. 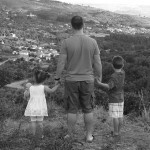 Netflix remains a staple in our house, from the kids, to my wife to me so I like it long term. TSLA: 311.35. Tesla makes the list due to the fact that some of its technology is cutting edge and some of its products are viewed similar to that of an Apple product, cult like. I’m a fan of Elon Musk, even though he’s volatile along with his stock. An investor needs a strong stomach to hold a position in this stock but long term, I believe it will outperform. Patience is key with Tesla. NVDA: 193.50. When I first profiled NVIDIA Corporation in the Stock Trends for 2015, it was trading at $19.96. Well, the stock has returned 10x over the past three years. One may argue that the stock is exhausted and doesn’t have any gas left in the tank. Perhaps, but I was told the same thing last year when I placed NVDA on the list at $106.33. It went on to gain another 82% and peaked above $218 per share. 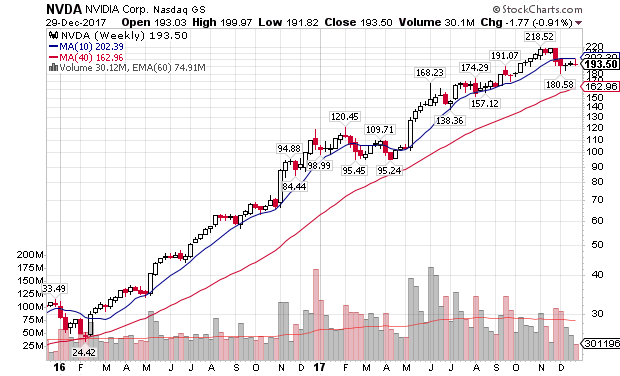 The stock has pulled back recently, trading below the 50d ma but still traded above the 200d ma. It’s been basing the past 4 weeks and may do so for a while longer which could provide an opportunity to add shares. The stock has been trending higher for 3 years and I’m not convinced its done until it says otherwise. Let’s keep riding it until the trend ends. SNAP: 14.61. Snapchat is the riskiest selection within this tech group. FB and Instagram are more mature within a profitable business model but there’s always room for two. After spending time with family and friends over the holidays, I realized how much the 10yr old to 25yr old generation uses this platform. I have never used the app myself and it doesn’t reside on my phone but something in my gut says it’s a buy in 2018. As a discretionary investor, let’s put some money behind that gut feel and see what happens. If it fails, I’ll sell and protect capital from a larger loss. In the case of this mock portfolio, we’re going to hold it for the year. I’m uncomfortable with the fact that they are not profitable yet but tech companies can get away with that while they establish their user base and products/services. IMMU: 16.16. 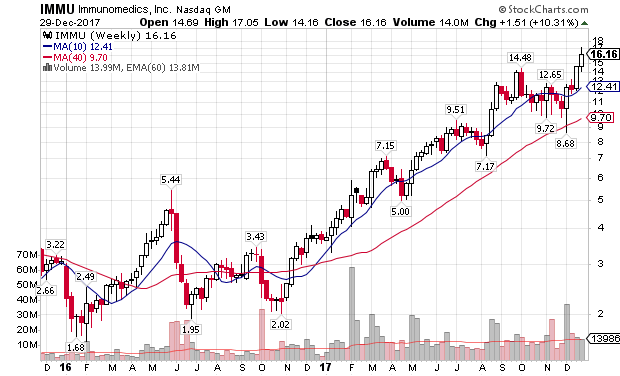 Immunomedics, Inc. is a bio-pharma company that focuses on the development of products to treat cancer, autoimmune disorders and other diseases. The company has several treatments in stage 2 and stage 3 trials, with initial data looking favorable. The company is small, not profitable and relatively unknown but is poised to grow and become profitable, should a treatment or two get approval from the FDA. Disclaimer: I grabbed shares under $10 and I am looking to add to the position. 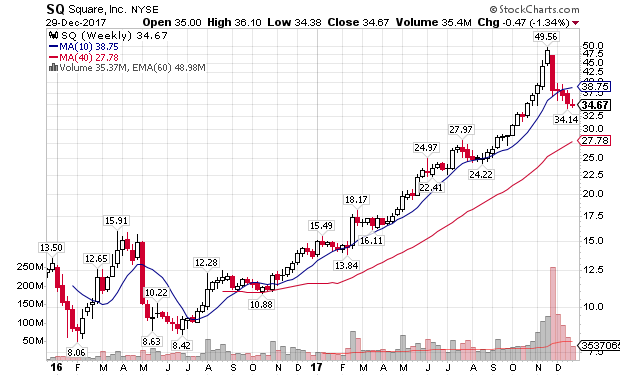 As on now, the stock has jumped more than 50% over the past month so I’d like to gauge the action heading into the New Year. It’s extended from both the 50d and 200d moving averages. 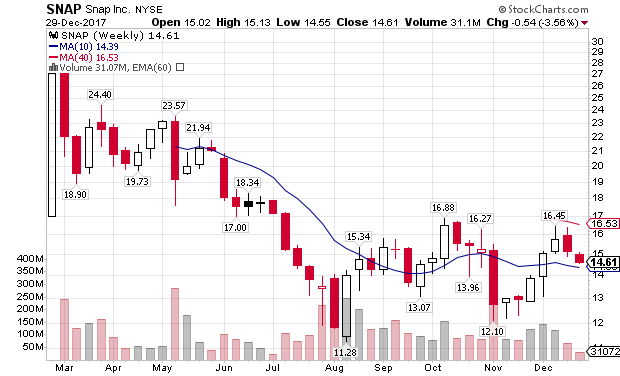 Any hold of support on the $14 range would be an ideal location to grab shares. WEED.CA: 29.74. 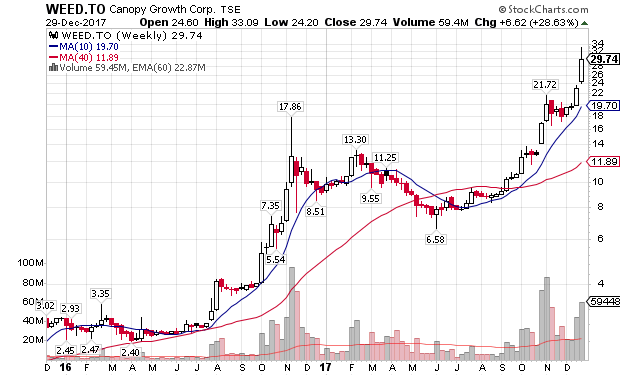 Canopy Growth Corp. produces and sells medical marijuana in Canada. The company offers dried, oil, and softgel cannabis products and also sells its products online. The stock has exploded in price recently due to the anticipated legalization of recreational marijuana in Canada in July 2018. California legalized recreational marijuana today (1/1/18) so the momentum train has left the station. Eight states currently allow recreational marijuana in the USA but I believe this figure will double over the next couple of years. If that’s the case, this stock and others should be setup for strong growth. Specifically, the stock is extended after breakouting out above $21 just before the New Year. Let it digest and form a new base before blindly buying shares. Wishing you all continued success in 2018! SFIX didn’t make it into your wife’s mutual fund? When you tweeted about the company it was ~$20 and climbed as high as ~$30 before current pullback. Do you think AMZ. will stomp them out? Will, there’s something about SFIX that I don’t like, from a stock perspective. I’m not saying that it will go down but I am going to avoid, personally, for now. Hi Chris,What Exchange are you using to trade both Ethereum and Litecoin?